Former stumper Syed Kirmani was bestowed with the prestigious Col. CK Nayudu Lifetime Achievement Award for his contribution to Indian cricket, while Test captain Virat Kohli bagged the Polly Umrigar Trophy for Cricketer of the Year in the BCCI awards night in Mumbai. The 66-year-old former India cricketer and member of the 1983 World Cup-winning squad was presented the award by BCCI president president Shashank Manohar at the Cricket Board's annual awards (2014-15 season) ceremony. 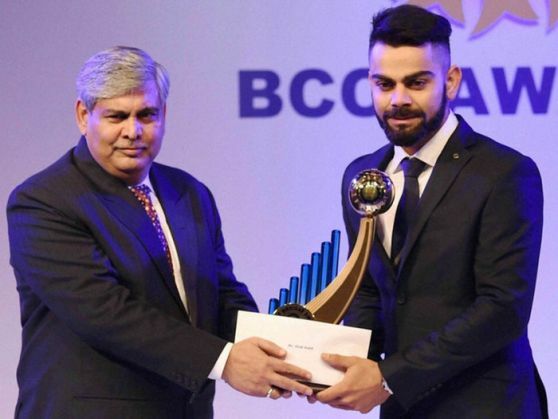 The coveted Polly Umrigar award was also handed over to Kohli by Manohar. The Indian Test skipper, who has won two consecutive bilateral series against Sri Lanka and South Africa, took to twitter to express his happiness. Kirmani appeared in 49 ODIs and played a crucial role in the do-or-die World Cup match against Zimbabwe at Turnbridge Wells by putting on a century partnership with captain Kapil Dev to rescue the team from a precarious 17 for five. After his playing career, Kirmani served as chief selector and was a vice-president of the Karnataka State Cricket Association (KSCA). Karnataka State Cricket Association won the best state association of the year honour for achieving the treble of winning the Ranji Trophy, Irani Cup and Vijay Hazare Trophy in the 2014-15 season. Kirmani, who was also given the award of citation, trophy and Rs 25 lakh, took a mild dig at modern wicketkeepers when asked about the difference from his time to the present day. "These days it's not about wicket keeping techniques but just about producing results. Dhoni has been able to do it," he said before praising the limited overs skipper, who was in the audience and grinning: "Good job, Dhoni." "I am proud to have kept wickets to the three spin legends - Erapalli Prasanna, B S Chandrasekar and Bishen Bedi. The only thing in my mind when playing was to do well and keep the tri colour flying. I thank the BCCI for honouring me with the C K Nayudu Lifetime Achievement Award," he remarked over his career. Kirmani, who was understudy to Farokh Engineer on successive visits to England in 1971 and 1974 before taking over as the no.1 gloveman, effected 198 dismissals in 88 Tests during the latter period of the famous Indian spin quartet. India's Test captain Virat Kohli revealed that the greatest moment of his career so far is the Test series in Australia, which India lost 0-2, but not before giving a tough fight to the hosts. "It is important to start the year well and we were able to do so in Australia. I compliment the entire team. It was the greatest moment of my career so far and would probably remain so," he said. Referring to the great chase the team made in Adelaide before falling short narrowly, Kohli said, "Some days you bat like a man possessed. All I had in my head was the target of 367," he said. Talking about the knock of 107 against Pakistan in the subsequent World Cup, the Delhi stalwart said that on the morning of the match when he woke up he saw 3000 people on the bridge that connected the hotel to the stadium with musical instruments and flags. "There was such a frenzy and it struck me that I am going to play in front of these guys in three hours. I challenged myself to do it and I was able to do it," Kohli remarked. Best umpire in domestic cricket in 2014-15: O Nandan, Karnataka. Best overall performance in 2014-15: Karnataka State Cricket Association - 14 points. The world just got its first transgender fusion band. And all 6 of them are Indian! READ NEXT >> The world just got its first transgender fusion band. And all 6 of them are Indian!